A few years ago my parents gave us a gift certificate for a Christmas gift to have our family photos taken. It was the best present ever! We waited until summer and then had the photographer come out here to the lake to take pictures. I love how they all turned out. This is one of my favorites of us sitting on the dock. I have never truly loved the frame I had it in though. So today I made my own frame and am very happy with the way it turned out! 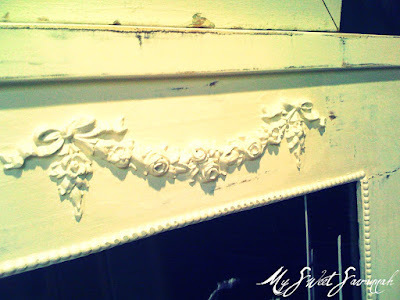 I added tons of girly shabby chic detail! I get all my appliques here. They are super nice and ship extremely fast! I got this beading there too. I now want to "bead" everything in my house! I may do a little spot on my kitchen island next to the beverage fridge! so you may have to wait awhile to see the final results! "trying to convince my husband that the one I like is the one we are getting"
need to go check out that site. Melaine, I can see the direction that your living room is taking! I cannot wait to see what you do with this room. Your family picture is absolutely priceless. There could not be a better image of your family and your lifestyle. So much better than those stages photos of yester year! Take care. Is your hair covering your husband's face? 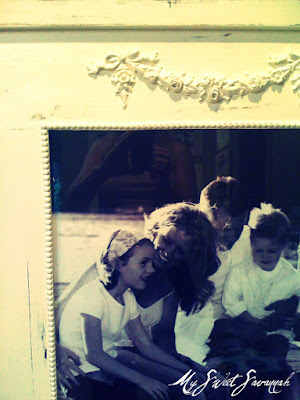 Gorgeous photo - and gorgeous frame - wish I could have you make one, it is EXACTLY what I like! 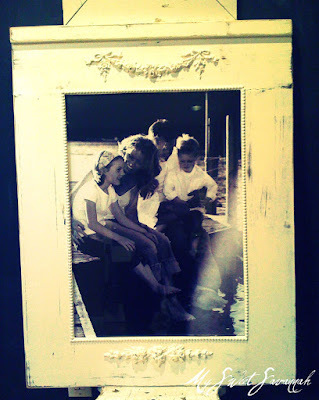 I love the frame and I love the picture, especially after spending a day on the lake my in laws live on. I am going to check out that site. I hope you will come over and show what you made, at my Knock Off Knock Out party Monday. 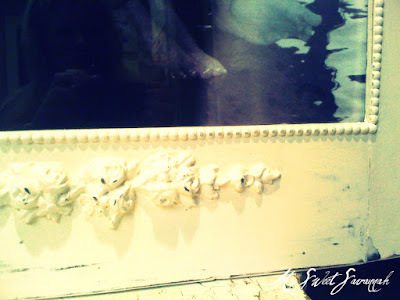 I bought a bunch of the appliques and did my daughters dresser and a huge mirror we made for her. I also did a frame with beading like that. I am working on a post about frames so it will be featured soon. What a delightful frame & photo. I'm looking forward to seeing your progress - but I understand how things get done more efficiently when the kids are back in school. I just love your style. When you do get it done it's going to look amazing!! From one mamma to another... those are some wonderful appliques. And the frame and picture really look pretty! Loving the picture and the new frame you made for it. I adore natural shots instead of the posed ones ~ a keeper for sure and I know it will find a home once your living room is done!